Global capital project and infrastructure spending is expected to grow to more than $9 trillion annually by 2025, up from $4 trillion in 2012, according to a new report from PwC, Capital project and infrastructure spending: Outlook to 2025​. The report, for which Oxford Economics provided research support, analyses infrastructure spending across 49 of the world’s largest economies which account for 90 percent of global economic output. It estimates the scale of current infrastructure investment and assesses the prospects for future investment from now to 2025. 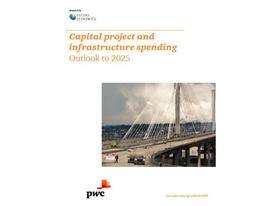 Overall, close to $78 trillion is expected to be spent globally between now and 2025 on capital projects and infrastructure. The report finds that during 2011-12, the global infrastructure market rebounded from the global financial crisis, and will continue to grow between 6-7% yearly to 2025. The recovery will be geographically uneven, led overwhelmingly by Asia, as spending overall shifts from West to East. The report shows that the Asia-Pacific market will represent nearly 60 percent of all global infrastructure spending by 2025, driven mainly by China’s growth. Western Europe’s share will shrink to less than 10 percent from twice as much just a few years ago. Long term underlying trends in demographics, technology, natural resources, urbanization and shifting economic power will continue to have an enormous impact on which areas of spending will grow. “Emerging markets, especially China and other countries in Asia, without the burden of recovering from a financial crisis s, will see much faster growth in infrastructure spending. In contrast to Asia-Pacific’s success, investment in western economies has been more constrained by the legacy of banking crises, fiscal austerity and a shallow economic recovery. Western Europe’s share will shrink to less than 10 percent from twice as much just a few years ago. While the rate of growth will be slower for mature economies, North America is expected to fare better than Western Europe, where total infrastructure spending in nominal dollar terms is unlikely to reach pre-crisis levels until at least 2020. Demographic factors: for example, aging populations particularly in Western Europe and Japan, will mean an increased share of available social investment for health facilities. Continuing process of urbanization: the continuing process of urbanization generates demand for investment in utility supply. Natural resources: natural resources and policy frameworks exploiting them will play a key role in determining the pattern of infrastructure spending leading to increased extractive spending.